Although there are a good number of Newport RI wedding caterers located in the city of Newport, there are scores of other area caterers that service Newport weddings from other cities like Providence and beyond. That means you can choose from dozens of caterers for your special day. Many Newport wedding caterers even have local offices here in town, so you can visit multiple offices in a single day while planning your Newport wedding. Don't let the catering budget for your wedding deter you from exploring all the options. You'd be surprised at what the catering chefs can create with easy access to some of the freshest-caught seafood in the world. In addition, many farms surround Newport on Aquidneck Island providing catering companies with fresh farm-to-table ingredients. So let your imagination be your guide and your guests will leave your wedding wanting more of the delicious food you've provided for your wedding reception. Taking the time to choose the right wedding caterer can really make the difference between a good wedding and a great wedding. From casual clambakes on the beach to sushi and elegant sit down affairs, Newport RI wedding caterers can make your dream wedding come true. Besides traditional receptions, caterers will go wherever they are asked, including yachts or boats, beaches and vineyards. 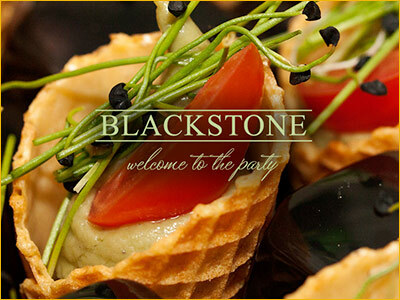 From a casual cocktail party to a formal wedding, Blackstone Caterers offers consistently top-notch food and unsurpassed service. Known for many events in Newport, Blackstone provides creative and unique menus with the backing of many years in the food service business. A great choice for your wedding or special event! 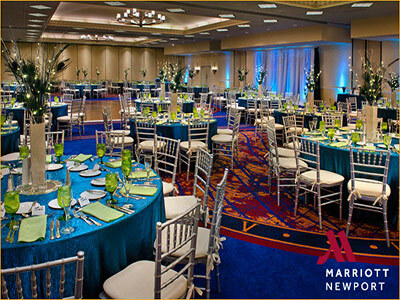 Let the professionals at Newport Marriott make your special day a true success with a meal planned and prepared just for you. Expect only the finest quality and presentation from one of Newport's finest catering services, whether you celebrate at the hotel or at another location around Newport.